The “cook vs chef” dynamic is one that I’ve been thinking about more and more. I touched on it in You’re Not Stuck That Way, Self Education, Unqualified Experts, and most recently in Huckster, but WBW gives the best start to finish overview of the difference between reasoning from first principles and following the crowd. Reasoning from first principles isn’t new, Aristotle talked about it extensively in Nichomachean Ethics, and the practice originated with Socrates (though, probably earlier). Socrates’ argumentative style was about drilling someone down to their first principles and in the process showing that they were faulty. I have the question: “are you being a chef or a cook?” in a sticky note on my desktop now to keep reminding me to think about it. Am I thinking or acting a way because someone else said so, or because I determined that was the best? Any time I’ve done something worthwhile it’s been the latter, so I want to focus on doing exclusively that as much as possible. Reasoning from First Principles: A scientist gathers together only what he or she knows to be true— the first principles— and uses those as the puzzle pieces with which to construct a conclusion. 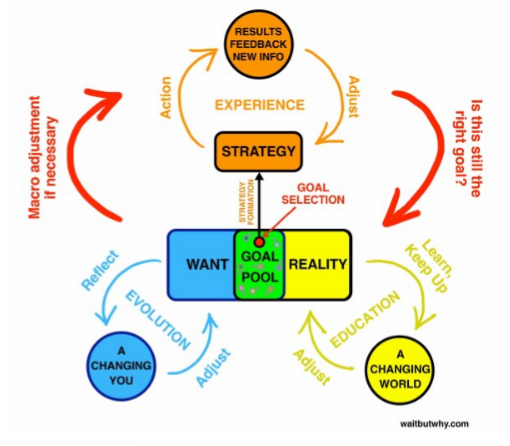 Basic system for planning: where your wants and reality overlap is where your goals come from, then you pick a goal and develop a strategy from it. Filling in the Want box from first principles requires a deep, honest, and independent understanding of yourself. Filling in the Reality box requires the clearest possible picture of the actual facts of both the world and your own abilities. 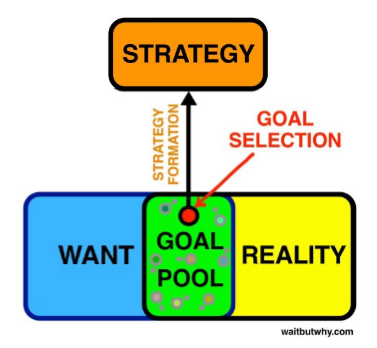 The Goal Pool should double as a Goal Selection Laboratory that contains tools for intelligently measuring and weighing options. 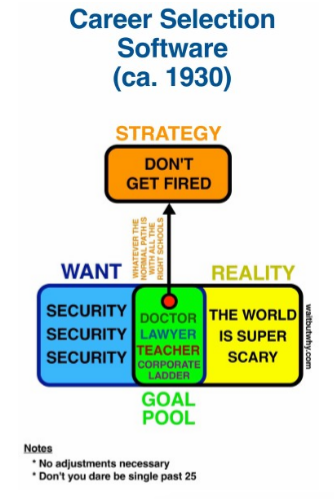 And strategies should be formed based on what you know, not on what is typically done. Each piece has to be built on and constantly updated purely by reasoning from first principles. School is built around turning us into factory workers, it kills off creativity and expects you to just color in the lines, following the instruction of teachers and parents. Kids who spend longer in school become less creative. Many people grow up never developing the ability to question why they think things are “the answer.” Common example is career choices. Why do you think that career choice / that major is a good one? Probably because someone like a parent told you it was, based on their own view of the world. Some people learn to throw out dogma, but then immediately eat up another form of dogma. Dogma frequently manifests itself into tribes, groups of people with similar dogma. We join them willingly, but as we get deeper into them, we start taking the word of the tribe as law and stop questioning our first principles. A way to test if you’re in a dogmatic tribe is to propose something strongly contrary to the views of the tribe. Telling your democrat friends that Trump might be a good candidate, for example. A chef invents recipes, puts new things together, creates new dishes. A cook follows recipes and does things that have been done before. When thrust into a new situation without knowing what to do, you can either create or copy. A chef creates a solution from first principles, a cook copies someone else’s solution. This is where the differences are most apparent, and help us realize how much we do of each. What do you do when you don’t know what to do? We all think we’re further right than we really are. We want to believe we’re chefs, but most of us are sitting in various degrees of cook-dom. 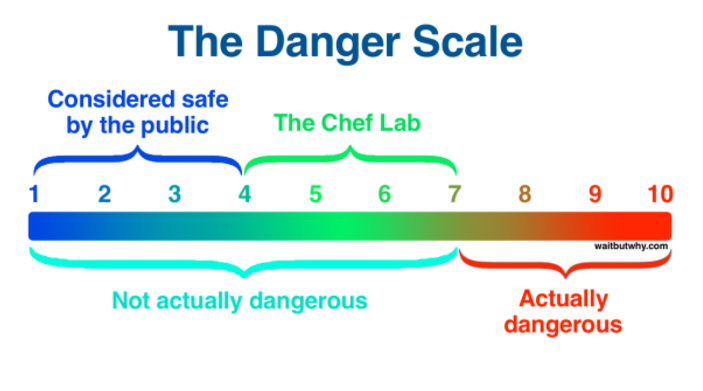 We frequently mistake a chef’s accurate understanding of risk for courage, not realizing that most of us have a woefully exaggerated belief in things being risky. We also mistake their originality for ingenuity. Simply by ditching the guidebook in a foreign country, interesting things are bound to happen. When a chef refuses to reason by analogy, the chef opens up the possibility to make a huge splash with each project. It didn’t take a genius to come up with the design of an iphone, it’s pretty simple, it just required that they not copy. Whatever the time, place, or industry, anytime something really big happens, there’s almost always an experimenting chef at the center of it— not being anything magical, just trusting their brain and working from scratch. Our world, like our cuisines, was created by these people— the rest of us are just along for the ride. The thing you really want to look closely for is unjustified certainty. Where in life do you feel so right about something that it doesn’t qualify as a hypothesis or even a theory, but it feels like a proof? It’s hard— you have to take the leap to chefdom separately in each part of your life— but it seems like with each successive cook → chef breakthrough, future breakthroughs become easier to come by. Eventually, you must hit a tipping point and trusting your own software becomes your way of life— and as Jobs says, you’ll never be the same again. Self-Loathing cook: Insecure cook + epiphany 2, they know nobody knows what they’re doing, but they still play along and hate themselves for it. We’re more afraid of public speaking than texting on the highway, more afraid of approaching an attractive stranger in a bar than marrying the wrong person, more afraid of not being able to afford the same lifestyle as our friends than spending 50 years in a meaningless career— all because embarrassment, rejection, and not fitting in really sucked for hunters and gatherers. When we see chefs displaying what looks like incredible courage, they’re usually just in the Chef Lab. The Chef Lab is where all the action is and where the path to many people’s dreams lies— dreams about their career, about love, about adventure. But even though its doors are always open, most people never set foot in it for the same reason so many Americans never visit some of the world’s most interesting countries— because of an incorrect assumption that it’s a dangerous place. The challenge with this last epiphany is to somehow figure out a way to lose respect for your own fear. That respect is in our wiring, and the only way to weaken it is by defying it and seeing, when nothing bad ends up happening, that most of the fear you’ve been feeling has just been a smoke and mirrors act. If someone gave you a perfect simulation of today’s world to play in and told you that it’s all fake with no actual consequences— with the only rules being that you can’t break the law or harm anyone, and you still have to make sure to support your and your family’s basic needs— what would you do? My guess is that most people would do all kinds of things they’d love to do in their real life but wouldn’t dare to try, and that by behaving that way, they’d end up quickly getting a life going in the simulation that’s both far more successful and much truer to themselves than the real life they’re currently living. To be a chef: So if we want to think like a scientist more often in life, those are the three key objectives— to be humbler about what we know, more confident about what’s possible, and less afraid of things that don’t matter.